inSpirit: UUA Bookstore and Gift Shop: Let the Students Speak! Let the Students Speak! 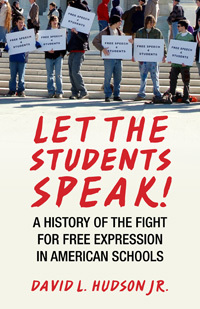 details the rich history and growth of the First Amendment in public schools, from the early nineteenth-century's failed student free-expression claims to the development of protection for students by the U.S. Supreme Court. David Hudson brings this history vividly alive by drawing from interviews with key student litigants in famous cases, including John Tinker of Tinker v. Des Moines Independent School District and Joe Frederick of the "Bong Hits 4 Jesus" case, Morse v. Frederick. He goes on to discuss the raging free-speech controversies in public schools today, including dress codes and uniforms, cyberbullying, and the regulation of any violent-themed expression in a post-Columbine and Virginia Tech environment. This book should be required reading for students, teachers, and school administrators alike.